All of us use water in our homes and make it dirty.Rich in lather, mixed with oil, black– brown water that goes down the drains from sinks, showers, toilets, laundries is dirty. It is called waste water. This used water should not be wasted. We must clean it up by removing pollutants. Have you ever thought where the waste water goes and what happens to it? Clean water is a basic need of human being. Let us make a mind map of the many uses of clean water. You have studied about the increasing scarcity of fresh-water due to population growth, pollution, industrial development,mismanagement and other factors.Realising the urgency of the situation on the World Water Day, on 22 March 2005, the General Assembly of the United Nations proclaimed the period 2005 – 2015 as the International Decade for action on Water for life. 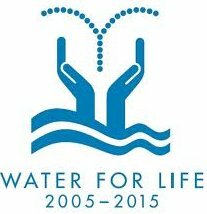 All efforts made during this decade aim to reduce by half the number of people who do not have access to safe drinking water. Cleaning of water is a process of removing pollutants before it enters a water body or is reused. This process of wastewater treatment is commonly known as Sewage Treatment. It takes place in several stages. Cleaning of water is a process of removing pollutants before it enters a water body or is reused. This process of waste water treatment is commonly known as “Sewage Treatment”. It takes place in several stages. Perform the following activity. It will help you understand the processes that take place at the wastewater treatment plant. Fill a large glass jar 3/4 full of water. Add some dirty organic matter such as grass pieces or orange peels, a small amount of detergent, and a few drops of an ink or any colou r.
Cap the jar, shake it well and let the mixture stand in the sun for two days. After two days, shake the mixture and pour a small sample into test tube. Label this test tube “Before treatment; Sample 1”. Use an aerator from an aquarium to bubble air through the sample in the glass jar. Allow several hours for aeration; leave the aerator attached overnight. If you do not have an aerator, use a mechanical stirrer or a mixer. You may have to stir it several times. The next day when aeration is complete, pour another sample into a second test tube. Label it as “After aeration; Sample 2”. Fold a piece of filter paper to form a cone. Wet the paper with tap water and then insert the cone in a funnel. Mount the funnel on a support . 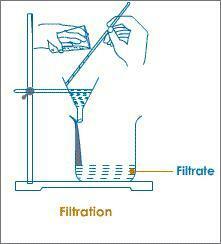 Pour the remaining aerated liquid through the filter into the beakers. Do not allow the liquid to spill over the filter. If the filtered liquid is not clear, filter it a few times till you get clear water. Pour a sample of the filtered water into a third test tube labeled “Filtered; Sample 3”. Pour another sample of the filtered water into a fourth test tube. Add a small piece of a chlorine tablet. Mix well until the water is clear. Label the test tube “Chlorinated; Sample 4”. Observe carefully the samples in all the test tubes. Do not taste! Just smell them! Water then goes to a Grit and sand removal tank. 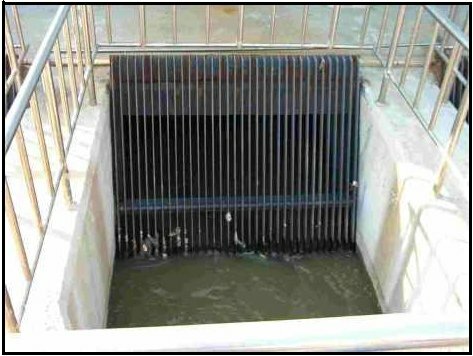 The speed of the incoming wastewater is decreased to allow sand, grit and pebbles to settle down. 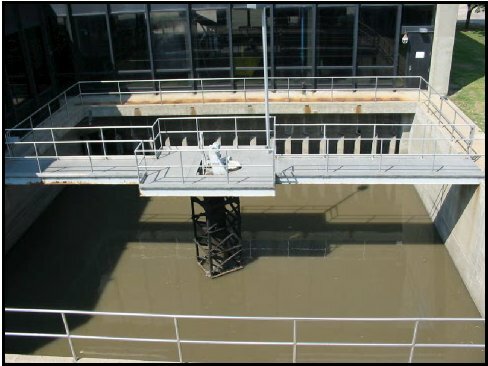 A clarifier is a tank with its central part inclined downwards so as to allow faeces to settle down.The water is then allowed to settle in a large tank which is sloped towards the middle. Solids like faeces settle at the bottom and are removed with a scraper. This is the sludge. A skimmer removes the floatable solids like oil and grease. Water so cleared is called clarified water. The sludge is transferred to a separate tank where it is decomposed by the anaerobic bacteria. The biogas produced in the process can be used as fuel or can be used to produce electricity. Air is pumped into the clarified water to help aerobic bacteria to grow. Bacteria consume human waste, food waste, soaps and other unwanted matter still remaining in clarified water . After several hours, the suspended microbes settle at the bottom of the tank as activated sludge. The water is then removed from the top. The activated sludge is about 97% water. The water is removed by sand drying beds or machines. Dried sludge is used as manure, returning organic matter and nutrients to the soil. The treated water has a very low level of organic material and suspended matter. It is discharged into a sea, a river or into the ground. Nature cleans it up further. Sometimes it may be necessary to disinfect water with chemicals like chlorine and ozone before releasing it into the distribution system. In the chemical process, take a chlorine tablet and put it in a beaker full of water. Observe that water is clean when the tablet dissolves. That is why chlorine tablets or ozone is used to disinfect water in treatment plants. Different mechanisms were used to treat water, even in the olden days. The ancient Greek and Indian writings dating back to as early as 2000 BC recommended water treatment methods. People knew about water treatment procedures back in 2000 BC. The Egyptians discovered the process of coagulation for water treatment. Eucalyptus trees are planted along the sewage ponds in which water is released after water treatment processes. Eucalyptus trees absorb wastewater from the pond and release pure water vapour into the atmosphere. Oils and fats can harden and block water pipes. Fats clog the soil pores in an open drain, reducing the effectiveness of filtration of water. So avoid throwing tea leaves, solid food remains and napkins into the drain. These block the flow of oxygen to the microbes that help in water treatment. Chemicals like paints, medicines, motor oil and solvents kill the microbes that help in water treatment. People need to be made aware of the ill effects of throwing pollutants into the drain. Used water is wastewater. Wastewater could be reused. Wastewater is treated in a sewage treatment plant. Treatment plants reduce pollutants in wastewater to a level where nature can take care of it. Where underground sewerage systems and refuse disposal systems are not available, the low cost on-site sanitation system can be adopted. 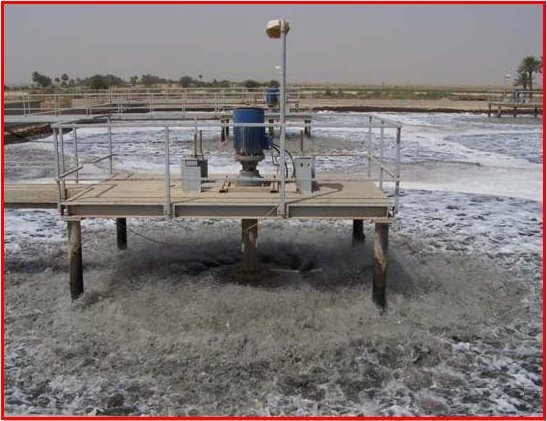 By-products of wastewater treatment are sludge and biogas.